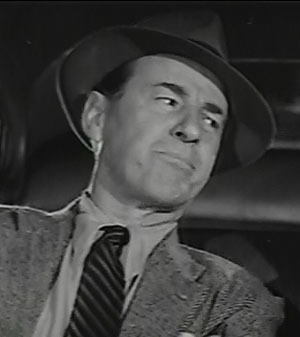 Above: Syd Saylor registers deadpan amusement in his final serial, Brenda Starr, Reporter (Columbia, 1945). Syd Saylor was born Leslie Sailor in Chicago. He lost his father (a traveling engineer) in the 1906 San Francisco earthquake, and took up an acting career after finishing high school in order to help support his family. He spent the latter years of the 1910s and the earlier years of the 1920s as a stage comedian in various Midwestern theatrical troupes, and also did a hitch with the Marines from 1918-1919. Around the middle of the 1920s, his uncle (a former member of Mack Sennett’s stock company) encouraged him to try his luck in Hollywood; Saylor arrived on the West Coast in 1926, and soon landed the leading role in a series of silent comedy shorts, produced by the Stern Brothers and released by Universal. These two-reelers (the “Let George Do It!” series) provided Saylor with steady work throughout the 1920s, although he found time to play occasional supporting parts in contemporary features. The series ended in 1929, and Saylor moved on to a new series of sound comedy shorts at Universal. This series, which ended in 1930, proved his last starring venue; he would spend the rest of his career as a comic character actor, typically playing small but noticeable bits in both A and B features. Occasionally, however, he would take a featured role as a comic sidekick in a B-film or in a serial; one of his first large sound-era parts was in the 1934 Mascot cliffhanger The Lost Jungle. 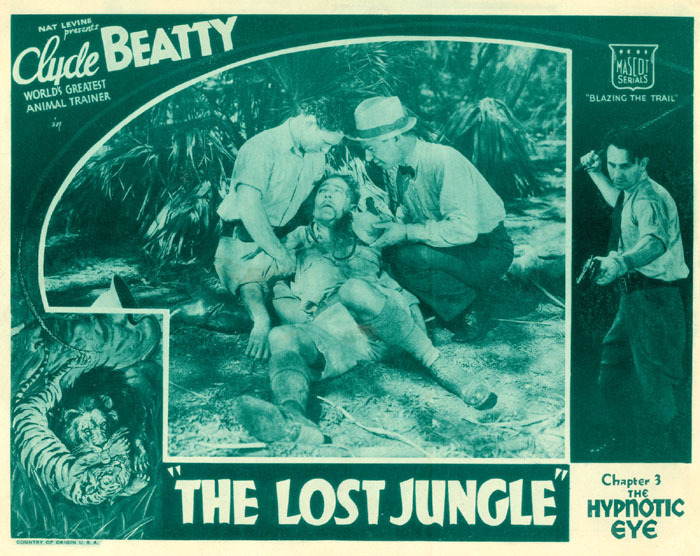 The Lost Jungle, a colorful and enjoyable cliffhanger, starred famed animal trainer Clyde Beatty as himself, and featured Saylor as his publicity agent Larry Henderson. En route to Asia to capture animals for Beatty’s circus, the heroes suffered a dirigible crash and found themselves trapped on an uncharted island well-stocked with dangerous fauna. Beatty and Saylor encountered a scientific expedition that had landed on the island, and helped the ship’s captain and his daughter battle both the island’s wildlife and the ship’s mutinous, treasure-crazed crew. Although Saylor mugged cartoonishly (and , of course, waggled his Adam’s apple) when confronted by the lions, tigers, and bears that inhabited the island, he also made his character seem savvy enough to carry lengthy action sequences on his own. He also handled his wise-cracking dialogue with aplomb, delivering a lively performance that contrasted nicely with the inexperienced Beatty’s more low-key acting. Above: Syd Saylor and Clyde Beatty explore a lost temple in a publicity still for The Lost Jungle (Mascot, 1934). Above: Clyde Beatty and Syd Saylor tend to wounded explorer Crauford Kent in a lobby card for The Lost Jungle (Mascot, 1934). Image provided by Chuck Anderson. Mascot cast Saylor in a second serial before the year was out. Mystery Mountain, an exciting modern-day Western chapterplay, pitted cowboy star Ken Maynard against a masked villain called the Rattler, who was setting a freight-wagon company and a railroad against each other in order to retain possession of a secret mountain gold mine. Saylor played Breezy Baker, an energetic reporter who assisted Maynard throughout the serial, and actually discovered the Rattler’s secret mine before the hero did. 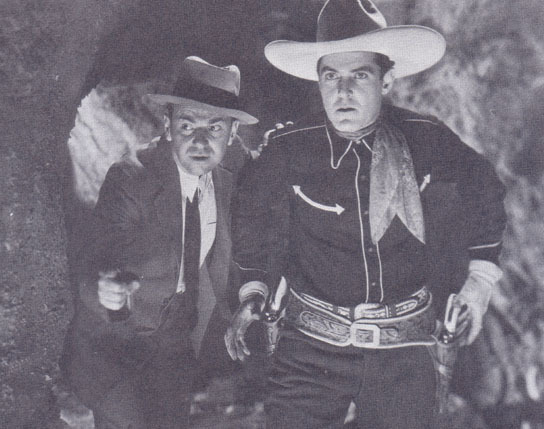 Like Lost Jungle, Mystery Mountain allowed Saylor plenty of opportunities to be heroic as well as funny, while his comic material was better than it had been in Jungle–particularly a scene in which he attempted to discover a suitable hat among a group of captured rustlers and a routine in which he tried to handled a refractory team of horses. 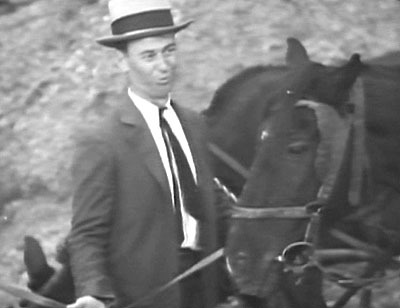 Above: Syd Saylor tries to coax an uncooperative horse in Mystery Mountain (Mascot, 1934). 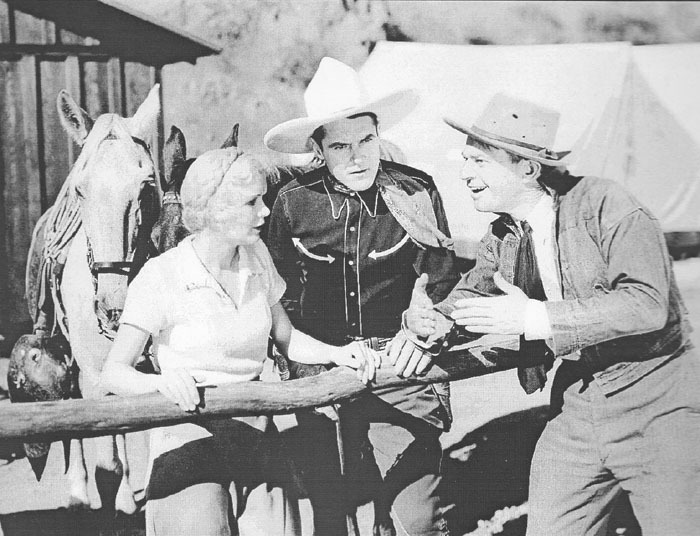 Above: Syd Saylor explains something to Ken Maynard and Verna Hillie in Mystery Mountain. After his two Mascot serials, Saylor returned to feature-film work, spending the rest of the 1930s playing small character parts in films for big studios like MGM and RKO (Murder in the Fleet, The Ex-Mrs. Bradford) and taking an occasional turn as a sidekick in B-films for Republic (The Three Mesquiteers), Victory (Kelly of the Secret Service), Grand National (Tex Ritter westerns like Arizona Days), and other small outfits. He remained a very busy character player in the 1940s, but largely abandoned sidekick parts; Brenda Starr, Reporter (Columbia, 1945), gave him one of his only co-starring 1940s roles. This serial featured Saylor as brash newspaper photographer Chuck Allen, who helped Brenda Starr (Joan Woodbury) cover a story involving gangsters and a satchel of stolen money. Brenda Starr was a dull and extremely padded serial, but Saylor (who appeared in more scenes than nominal leading man Kane Richmond) did his best to inject some energy into the proceedings, whether he was bantering with bumbling police detective Joe Devlin or cheerily helping Brenda snoop into the villains’ affairs. At times he played things more broadly and noisily than in his Mascot serials, evidently trying to compensate for the weakness of his material–but he was more subtly funny in other scenes, particularly when registering mischievous but concealed glee after hopelessly puzzling Devlin by manipulation of an adding machine. 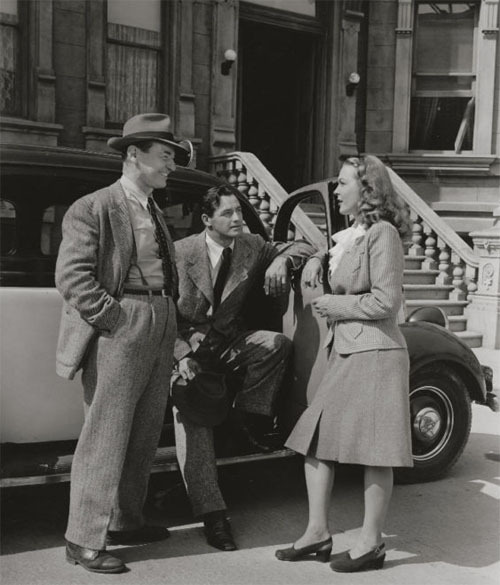 Above, from left to right: Syd Saylor, Kane Richmond, and Joan Woodbury in Brenda Starr, Reporter (Columbia, 1945). 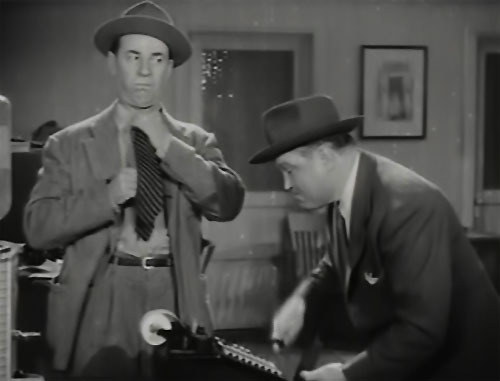 Above: Syd Saylor deadpans as Joe Devlin tries to figure out how much betting money Saylor owes him–by using an adding machine that Saylor’s surreptitiously monkeyed with in Brenda Starr, Reporter. 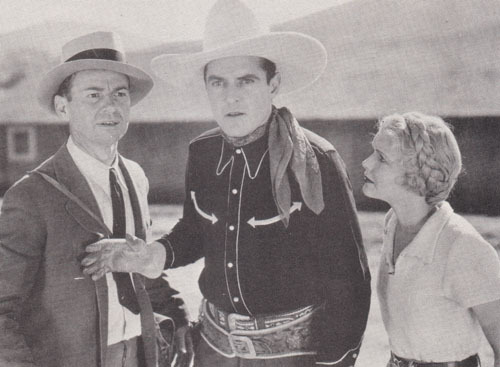 After playing sidekick to Bob Steele in a handful of mid-1940s PRC B-westerns, Saylor settled permanently into small roles for the rest of the 1940s. The 1950s found him working in both features and television, appearing on The Adventures of Superman, The George Burns and Gracie Allen Show, Maverick and many other shows; he also played the famed Bozo the Clown for a time on live local TV. His final screen appearance was in a low-budget independently-produced horror film called The Crawling Hand, which was released not long after Saylor passed away in Hollywood in 1962. Most full-fledged comedians were hampered by the fast-paced serial format, which kept their opportunities of performing comic routines at a minimum. Too many of them tried to combat this difficulty by hyperactive overacting, which only succeeded in annoying the audiences. Syd Saylor, however, kept himself in check in his serials, performing comic bits with aplomb but never–not even in Brenda Starr–trying to play them up too strongly. This self-restraint on his part made serial audiences not only willing to tolerate his clumsy or eccentric behavior, but happy to cheer for him when he succeeded in outsmarting the villains or otherwise saving the day. 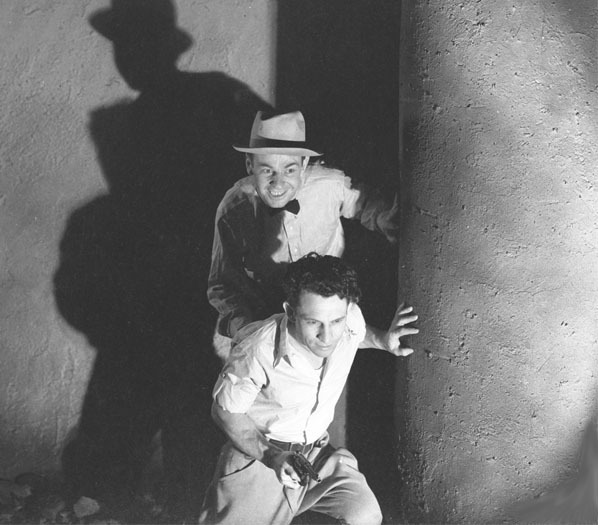 Above: Syd Saylor with Ken Maynard in Mystery Mountain (Mascot, 1934). Acknowledgements: My thanks to Dr. D. S. Berish, author of the Internet Movie Database’s biography of Syd Saylor, for information on Saylor’s early life. My thanks also to Chuck Anderson of the Old Corral, who generously provided me with the Lost Jungle lobby card featured above, and whose Syd Saylor page provided me with much additional biographical information.